This past Tuesday night, one of the most thrilling fights in recent memory, Anthony Mercado and Victor Vazquez waged an eight-round war for the ages that saw Mercado overcome a horrible cut over his right eye, a knockdown, and multiple instances where the fight could have been stopped to persevere and somehow comeback to win the fight. The bout, for which some at ringside were saying it was the best fight in Pennsylvania, headlined a nine-bout card at The Sands Bethlehem Event Center and was promoted by King’s Promotions. Mercado was cut badly over his right in round two from an accidental headbutt. In round three, Mercado landed a hard flurry on the ropes that forced Vazquez into the ropes, and referee Gary Rosato ruled that ropes kept Vazquez from being knocked down and administered an eight-count. Vazquez fought back in round four and landed a couple of booming left hooks that rocked Mercado. They continued to trade heavy shots at will, which led to some brutal exchanges with each guy landing some vicious power punches. In round six, Vazquez landed some booming shots that had Mercado in trouble for much of the round, One such flurry had Mercado seemingly a punch or two a way from getting stopped. At the end of the round, Vazquez landed a flush left hook to the jaw that put Mercado plummeting to the canvas. Mercado got up just as the bell rang, and he stumbled to the corner. Vazquez went in for the finish in round seven, but Mercado, with blood now covering the whole right side of his face, was able to stabilize himself and work his way back into the fight. Mercado made it all the way back, and was able to box his way to win the decisive eighth round. Mercado, 140.8 lbs of Puerto Rico won by scores of 77-74 and 76-75 twice to raise his mark to 12-5. Vazquez, 137.9 lbs of Yonkers, New York fought a great fight, but now falls to 10-5. In the co-feature, Raeese Aleem stopped Alcides Santiago at the end of round five of their scheduled six-round super bantamweight bout. Aleem beat Santiago down, and scored a knockdown in round five. Aleem, 121.9 lbs of Las Vegas, was making his first start under new trainer and former world champion Bones Adams, is now 12-0 with six knockouts. Santiago, 122.6 lbs of Arecibo, PR is 6-3. Joe Hanks stopped Terrance Marbra at 2:54 of round one of their six-round heavyweight bout. Hanks scored one knockdown before the fight was halted. Hanks, 253 lbs of Newark, NJ is 23-2 with 15 knockouts. Marbra, 220 lbs of Saint Petersburg, FL is 9-7. 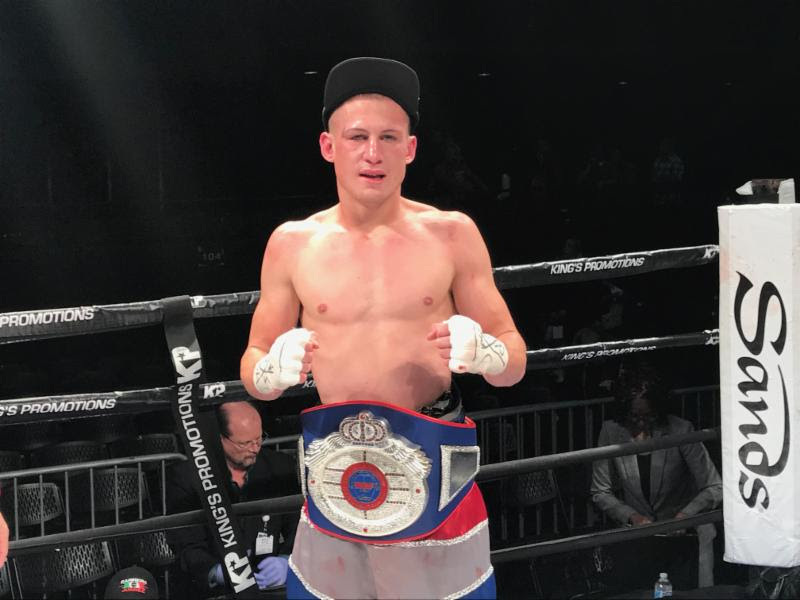 Erik Spring took a six-round unanimous decision over James Robinson in a rematch of junior middleweights. Spring sealed up the fight with a knockdown late in round six, and came home home with the win by scores of 59-54 twice, and 58-55. Spring, 153.3 lbs of Reading, PA is now 11-2-2. Robinson, 152.9 lbs of York, PA is 5-12-5. Colby Madison remained undefeated with a six-round unanimous decision over Nicoy Clarke in a heavyweight bout. Clarke fought most of the bout with a cut over his left eye that was caused by a punch. Madison, 241 lbs of Owings Mills, MD won by scores of 60-54 twice and 59-55, and is now 7-0-2. Clarke, 211.5 lbs of Jersey City, NJ is 2-2. Good looking prospect Money Powell IV won a six-round unanimous decision over Josue Obando in a middleweight contest. Powell, 163.1 lbs of Fort Mitchell, AL won by scores of 60-54 twice, and 59-55 to go to 8-0. Obando, 165 lbs of Jalisco, MEX is 16-23-1. Michael Coffie scored four knockdowns en-roue to a 2nd round stoppage over Curtis Head in a scheduled six-round heavyweight bout. Coffie registered the knockdowns evenly as he put Head on the canvas twice in each round, and the bout was stopped at 1:57. Coffie, 270.5 lbs of Brooklyn, NY is 4-0 with three knockouts. Head, 257 lbs of Southfield, MI is 4-3. Martino Jules thrilled his hometown fans by dropping Felix Sosa in round’s one and three, which paved the way for a four round unanimous decision in a contest featuring undefeated featherweights. Jules, 124.5 lbs of nearby Allentown, PA won by tallies of 40-34 on all cards, and is now 5-0. Sosa, 124.1 lbs of Jersey City, NJ is 1-1. Kenny Robles dropped Corey Gulley in round two, and finished him at 2:13 of round three from a wicked flurry of punches in a junior welterweight fight scheduled for six-rounds. Robles, 138.2 lbs of Staten Island, NY is now 4-1 with two knockouts. Gulley, 140.6 lbs of Killeen, TX is 2-3-2.